As we begin the month of August, the royals have slowed down and started their summer holidays. 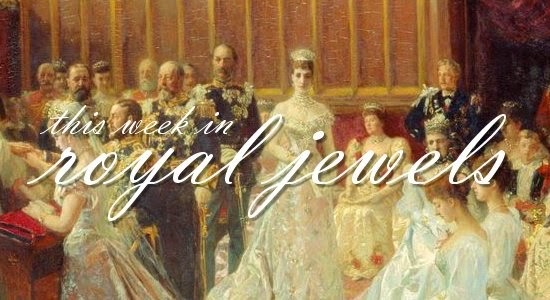 This month, we'll be looking at the top five jewel stories of the week -- but we've still got some sparkle close at hand! 5. With most of the Windsors gathered in Glasgow, the Prince of Wales and the Duchess of Cornwall have been heading out to other parts of the UK. On Wednesday, they visited the Sandringham Flower Show, and Camilla added a bit of glitter to her outfit courtesy her sparkling butterfly brooch. She's been wearing the brooch since at least 2006; it appears to be made of diamonds and sapphires. 3. In Scotland, the Countess of Strathearn kept her jewelry simple while watching the athletics competition at the Commonwealth Games: citrine earrings by Kiki McDonough, a necklace with a set of Asprey pendant charms, her famous engagement ring, plus her wedding ring and her diamond eternity band, and what looks to be yet another of the rainbow bracelets that children often give to royals during walkabouts these days. 2. Princess Charlene of Monaco added a new foreign order to her small (but growing) collection this week, when she was officially made a Dame Grand Cross of the Order of the Star of Italy. 1. She may not be the reigning queen consort any longer, but Queen Sofia of Spain is still very much the matriarch of the family. In Palma de Mallorca this week, she wore delicate jewelry while taking her grandchildren to sailing school.